The 'Essentials of Medical Astrology' is the standard book on Vedic astrology which lays down detailed principles relevant to the analysis of a horoscopic chart, with disease and its various aspects as the main focus of attention. Standardisation of approach to analysis of a chart related to disease. Use of four vargas, or divisional charts, and two dashas to ensure an accurate assessement of the chart. Discussion of principles of sound and unsound health. An elaborate approach to ensure accurate timing of onset of disease and its outcome. Hints about the possible site of disease as well as the nature of disease using the significations of houses and planets, and the Drekkanas. A detailed account of the principles of Balarishta and Arishta-Bhanga. The use of such subtle principles of Vedic astrology as the twenty-second Drekkana, the sixty-fourth Navamsha, the Sarpa Drekkana, and Gulika or Mandi, to decide on the onset and outcome of illness. Classical combinations indicating some of the common ailments, and the scientific approach to application of these principles to actual horoscopic charts. A must for all students of Vedic astrology. 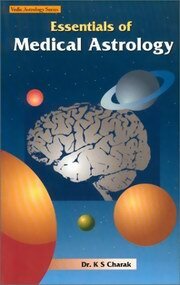 This is one of the finest studies of medical astrology ever published. The author holds an MS (Surgery), FRCS (UK), & is Head of the Department of Surgery at Indira Gandhi ESI Hospital at Jhilmil, Delhi. His English is excellent. The book is a unique and much needed addition to students of Vedic astrology.Although it lacks reference to diseases of the reproductive system and certain other diseases. However it is an excellent beginning point to understanding the workings of Vedic astrology regarding the cause and type of disease suffered and likely to be suffered by any person. The book is a unique and much needed addition to students of ..